Looking for a quick fix to jazz up your outdoor spaces? Try adding colorful accent rugs and doormats. A wide variety of sizes and styles, from traditional patterns to whimsical motifs, are available. They’re made of weather-resistant, recycled materials and brighten up any patio, deck or porch. 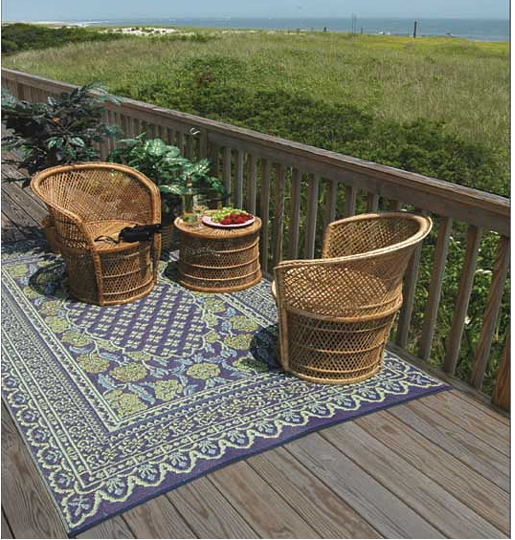 Gaiam offers hand-crafted, reversible Turkish patterned rugs made from recycled soda bottles in 6’x9′ and 4’x6′ sizes. You’ll also find door mats made from reclaimed marine rope or flip-flop foam! VivaTerra has many different stain-resistant styles on hand, from Moroccan and Oriental patterns to stripes and florals (made from recycled plastic bottles and packing materials). Available sizes are: 4’x6′, 5’x8′ and 6’x9′. Pottery Barn‘s Tauna Kilim Indoor/Outdoor Rug is handwoven from recycled polyester yarn and is available in numerous sizes. Williams-Sonoma sells a recycled plastic rug in a great graphic print by designer Thom Filicia. Both of these companies sell many kinds of outdoor rugs, however the ones mentioned here are the only ones with earth-friendly characteristics. Perhaps if many people sent them a note requesting more green products, we could make a difference together. Other Thom Filicia recycled rugs are available through QVC, Overstock.com and CSN stores.